Combustible solids have the capability of igniting and burning. Combustible liquids have a flashpoint at or above 100 degrees F, but below 200 degrees F.
Class II: Liquids have flash points at or above 100 degrees F (37.8 degrees C) and below 140 degrees F (60.0 degrees C). Class IIIA: Liquids have flash points at or above 140 degrees F (60.0 degrees C) and below 200 degrees F (93.4 degrees C). Class IIIB: Liquids have flash points at or above 200 degrees F (93.4 degrees C). Examples include oil-based paints, some solvents, kerosene and diesel fuel. Combustible chemical storage locker by US Chemical Storage. A survey of the workplace can help identify improper storage techniques; such as flammable or combustible materials stored on top of shelves, countertops, work benches, or on the ground. Analyze small quantity storage requirements and large quantity hazmat requirements, to ensure full compliance. Materials being stored inside of containers or cabinets that are rusting or have been eaten through by hazardous materials can also constitute improper combustible chemical storage. Larger quantities of combustible chemical storage and other hazmat must be identified in order to meet safety regulations. Combustible chemical storage lockers are designed to keep flammable, combustible and non-combustible chemicals safe, while keeping working conditions compliant. Analyze your working environment to ensure all safety and compliance requirements are met. According to OSHA 1910.106 combustible chemical storage should be stored in approved chemical storage lockers. Combustible chemical storage lockers must be equipped with different types of accessories, depending on the hazard classifications of the combustible materials being stored, handled or mixed and dispensed. Combustible storage lockers are commonly equipped with two vents, a combustible fire-rated wall construction, automatic sprinkler system or integral dry chemical fires suppression, explosion proof lighting, secondary sump containment and UL Listed self-closing fire doors. 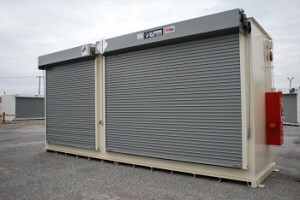 Fire-rated chemical storage lockers can be stored inside or outside, depending on application. Contact your local Fire Marshall for more information on your specific chemical storage situation. Bonding and grounding is the process of connecting an electrically conductive path from a dispensing container, a receiving container and an earth ground. Bonding and grounding eliminates potential static electricity buildup that could eventually lead to a spark that could cause a flash fire or explosion. Combustible chemical storage lockers are equipped with static grounding systems to ensure safe chemical storage processes. To learn more about chemical storage lockers by US Chemical Storage visit us online or call 888-294-2729 for a free chemical storage consultation.